Hidcote Manor Garden is one of Britain's best and yet one of its most unlikely gardens. Find out how an eccentric and lonely American millionaire created the quintessential English country garden. By all rights, Hidcote Manor Garden should not even exist. When wealthy Paris-born American, Maj. Lawrence Johnston decided to create it, professional garden experts thought he was mad. The soil was all wrong, the site - high on the Cotswolds escarpment - was too exposed to wind and harsh weather. But gardening and plants were the obsessions of this shy and little known gardening patron. And the garden he created was so special that, in 1948, it became the first property acquired by the National Trust on the basis of its garden alone. Johnston, the well-educated heir of a Baltimore stockbroking family became a British subect after graduating from Cambridge University and enlisted in the military to serve in the Second Boer War. On his return, he seems to have been somewhat at loose ends - though much that is known about his is speculative. His mother Gertrude Winthrop, who had ambitions for her him to become established as a British country gentleman, bought Hidcote Manor to launch him in society. Apparently, he had other ideas. He began to create Hidcote Manor Garden in 1907, and except for time out serving in World War I, it became his life's work. During the 1920s and 30s, Johnston kept 12 full time gardeners busy designing and planting to his ever more ambitious ideas. A complete amatuer, he was wealthy enough to seek the advice of many of the top artists and garden designers of the day including Alfred Parsons and Gertrude Jekyll. When he decided he wanted massive topiary plants, he bought them, fully grown and shaped. He Johnston traveled the world in his search for unusual plants, participating in and funding plant collecting expedions to the Swiss Alps, the Andes, South Africa, Kenya, Burma, Yunnan in China, the South of France, Formosa, the Maritime Alps and the Atlas Mountains in Morocco. He was known to have introduced more than 40 new plants to the United Kingdom. Many of them named after him. His mother never approved of the amounts of family money he lavished on the garden. In fact, when she died, she left the bulk of her estate to a charity only leaving him a protected income, in trust. Mind you, it was, by all accounts a very substantial income. Until the 1930s, Hidcote Manor Garden with its series of garden rooms and collections of exotic plants, was virtually unknown outside Johnston's small circle of gardeners and designers. Eventually, Johnston turned his attention to creating a garden in Menton on the French Riviera and, in 1947, passed Hidcote on to the National Trust. Unfortunately, from the 1950s to the 1980s, the National Trust's gardens advisor of the day made so many changes that he may have buried Johnston's original ideas in his own concepts. More recently, the Trust has been using pictures, gardener's notes, archives and excavations to recreate Johnston's garden. Among the finds, a rockery completely overgrown with shrubs. Today, garden visitors can expect a delightful surprise, hidden down a series of twisting country lanes in the Cotswolds. The garden is arranged as a series of outdoor rooms separated by walls and hedges. The different styles of the outdoor rooms reach their peak at different times of year, so there is usually something interesting to see. 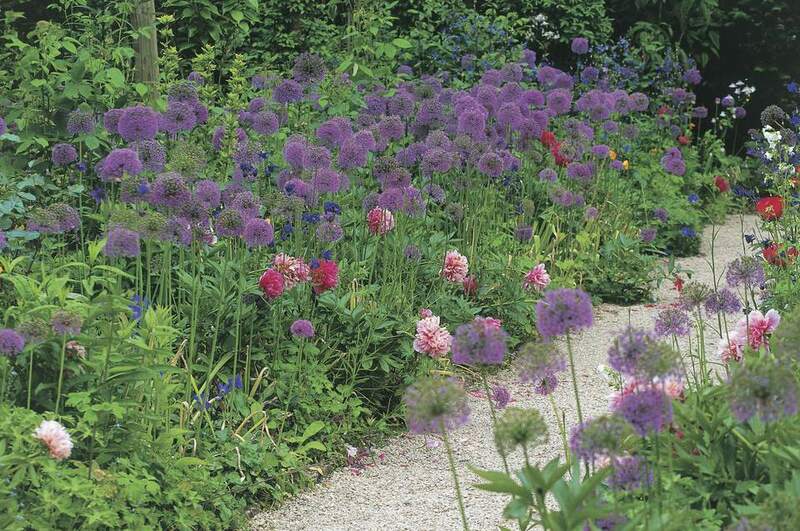 Stunning, almost painterly herbaceous borders. Crowded, abundant plantings alternating with calm, open areas. By car: Hidcote Manor is close to Mickleton, a village 4 miles northeast of Chipping Campden in the North Cotswolds and 1 mile east of the B4632, off the B4081. If you use a satnav system, the OS map reference is 151:SP176429. Free parking is available about 100 yards from the garden. By train: Honeybourne Station is 4.5 miles away. Regular trains from London Paddington to Worcester, Hereford and Great Malvern stop at Honeybourne. Check National Rail Enquiries for times and prices. The journey takes about 90 minutes. The station has no dedicated taxi rank but you can book a taxi in advance from Chipping Campden Taxis. Opening times: The gardens are open from the end of March to the end of October and weekends through the winter months. It's closed throughout the month of January. Insider Tip: The garden gets crowded on bank holidays and in good weather and admissions may be limited. It's less crowded after 3 p.m.
See their website for shop, and restaurant openings. Admission: Adult, child and family tickets available. Check the website for current prices. Stratford-upon-Avon is just 11 miles away. When you're ready to take a break from Shakespeare's birthplace, Hidcote is a great place to chill. Not all of England's garden stories are about aristocrats employing famous celebrity gardeners to adorn their stately homes. English people at all levels of society have long been keen gardeners. Not all wonderful gardens are attached to stately homes. Find out more about allotments where the ordinary working men and women of England's cities and towns can do a bit of gardening for themselves.